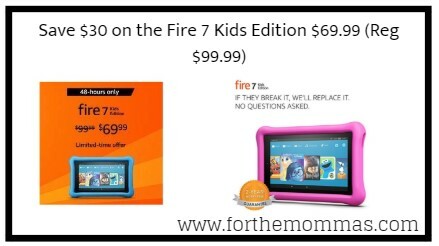 For 48 hours only, Amazon has Fire 7 Kids Edition $69.99 (Reg $99.99) with free shipping. One year of FreeTime Unlimited gives your kids access to 15,000 popular apps and games, videos, books, and educational content from PBS Kids, Nickelodeon, Disney, and more. Add even more content to your child’s profile in FreeTime to give them selected access to apps in your personal library, such as Netflix, YouTube, and Minecraft.